In a world of Auto-Tune and drum machines, where strobe lights are commonplace and smoke machines expected, artists who combine talent and theatrics at concerts are rare. A handful of artists, however, have transcended industrial inertia toward this mediocrity. Last Thursday night at Boston’s Bank of America Pavilion, Florence and the Machine proved themselves to be part of this elite group. The allure of Florence Welch, lead vocalist of F&M, comes in her swirl of antiquity and modernity. Recalling a medieval age, the sustain of her ethereal voice echoes to match the flow of her billowy outfit in lyrics that allude to Greek and Biblical mythology, a feeling accentuated by her palatial tapestries onstage. Florence and the Machine brought their uniquely vintage sound to the Bank of America Pavillion on Thursday, June 23. Photo credit Michela Smith. At the same time, the emotion in Florence’s face and her accented arms as she sensually whisks across stage immediately recall the modern diva, while her screams in some pieces invoke Janis Joplin. 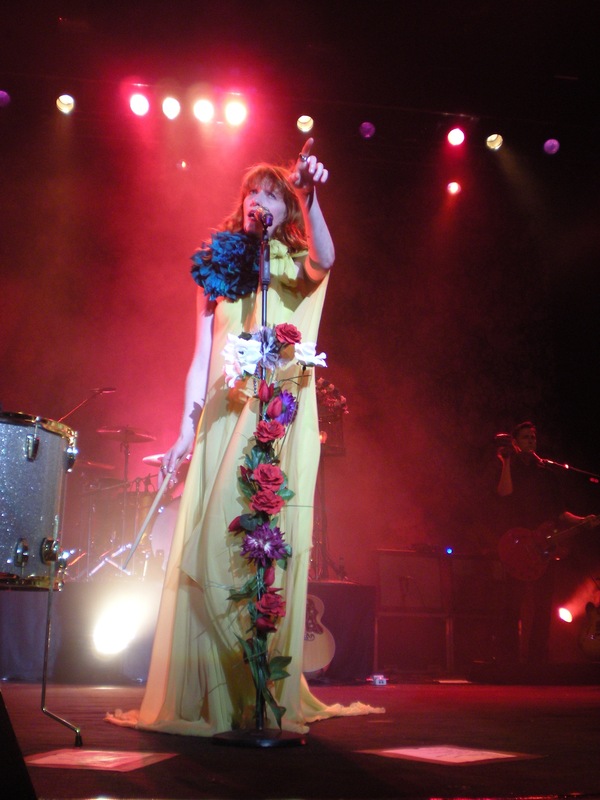 With such a dynamic backed by such powerful pipes, it’s fitting that Florence and the Machine’s appearance Thursday night was to promote Lungs, an album released in 2008 that was still responsible for their 2010 “Best New Artist” Grammy nomination. Performing to their largest audience to date, F&M entranced Boston immediately with the chilling “My Boy Builds Coffins“ and continued pounding with “Between Two Lungs” and “Drumming Song.” For these and the following yodeled “Strangeness and Charm,” Florence struck on a floor tom downstage, accentuating the momentum. After the animalistic “Howl” and the softer, “Hurricane Drunk” that spotlights Tom Monger’s harp, F&M premiered the new “What the Water Gave Me.” Previewing a new sound, F&M diverged significantly from Lungs to feature harpsichord in an elegant bow to the transcendental power of water. The piece additionally followed a more traditional Western-rock song pattern, a refreshing change from the perpetually undulating pieces on Lungs that often make many of the songs sound identical. To feature her hit, “Cosmic Love,” Florence appropriately removed her medieval tapestry to reveal a wall of twinkling stars to back this acoustic set. Performing both “Cosmic Love” and “I’m Not Calling You a Liar” solely accompanied by harp and guitar, the half-band performed eloquently as every plucked string was audible and every lyric clearly annunciated. The musical sensitivity also allowed Monger and guitarist Robert Ackroyd opportunities to shine. F&M fails in capturing an E-Street-Band-like camaraderie in which every musician is featured, so rare spotlight moments like these are especially appreciated. F&M could further improve in turning down the vocal reverb. Welch’s voice is exceptionally strong and while echoed vocals create F&M’s distinctive sound, adding too much effect often blurs the imaginative lyrics. Plugging back in with the electrifying “Blinding,” Florence captivatingly screamed through the pain of awaking from a fogged relationship – and realizing one’s shortsightedness. The pounding drums, dissonant strings and Florence’s raw emotion rendered it the best of the night. Her two audience-rousing closers, “You’ve Got the Love” and “Rabbit Heart (Raise it Up),” didn’t particularly stir this reviewer. Yet, the audience must have thought otherwise as the traditionally deafening slaps on the plastic Pavilion seats immediately called for an encore, signaling the audience’s exuberance. F&M again delivered promise for their musical future with their new, distinctive “Bedroom Hymns,” which combined sexual allusions, biblical themes and audience participation to nearly create a rock anthem. Predictably, F&M closed with their most famous, “Dog Days Are Over,” a fabulously energetic sing-along celebrating optimism that left all attendees with similarly heightened spirits. And if Florence and the Machine continue to perform as they did in Boston, they have good reason to celebrate the future too.